Do it onsite and without taking the fitting off the wall ! With advancing technology in the infrared heating marketplace has come an unwanted side effect: lamps are so well integrated into the heaters, that have become impossible for the untrained to even attempt changing. Many well known brands can take up to 20 minutes for an expert to swap over. 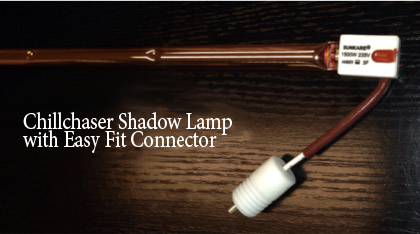 Our Shadow range are now exclusively fitted with the worlds most advanced lamp connection system enabling almost anyone to change a faulty or 1 broken lamp in a matter of three or four minutes. There is no loss in weather/waterproofing (IP65) whatsoever. This technological progress has been made possible by totally re thinking the way in which lamp fittings have evolved and utilising state-of- the-art heat resistant materials.